Occurs when wet wood expands and contracts from moisture and temperature change, causing the paint film to loosen, crack and roll at exposed edges and fall off. 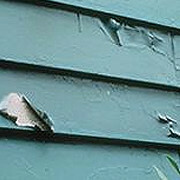 Affected surface area can widen and continue to loosen the paint film if left untreated. Inspect the outside of the building to identify and eliminate all sources of moisture, especially windows, trim areas and other joints. Repair leaks in the roof, clean out gutters and downspouts. Re-direct sprinklers if necessary. Trim nearby vegetation if you suspect it may cause peeling. If moist air is originating from inside the building, consider installing vents or exhaust fans, especially in kitchen, laundry and bathroom areas. If moisture is rising from the ground through the masonry, waterproof the foundation with a specially designed coating. Remove the portion of the wood that is touching the ground. Siding should come down no further than six inches above the ground. You can correct peeling from moisture on siding by inserting small plastic or aluminum wedges or shims in between the nail heads under each board. Remove all loose paint with a scraper or wire brush, down to the bare wood if necessary. Feather-sand rough edges for a smooth appearance and rinse thoroughly with a hose. Power-washing is recommended for larger areas (let wood dry for three to five days before priming). Prime bare wood with the appropriate primer. Read the label to determine how long the primer should dry before applying the top coat of paint. Repaint with two coats of a high-quality acrylic latex paint. If it is not possible to eliminate the source of moisture, repaint the stripped wood with a thin coat of latex paint. A water-repellent solution may be applied to exposed wood. Please note that these suggestions are provided as a service to you. We are unable to guarantee or be responsible for the results obtained by these procedures. If you have additional questions, ask any of our expert sales associates.